Hotel EA Sonata, Prague. EA Sonata Hotel Prague. 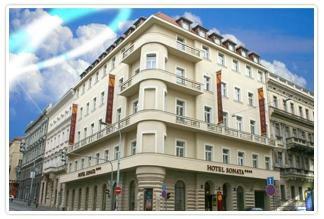 Euroagentur Chain presents the Sonata, a 4 star hotel located near the wonderful Wenceslas Square. It offers 55 comfortable double rooms fully equipped with the most modern amenities. The EA Hotel Sonata provides a conference center, an amazing relax center with sauna and whirpool and other special services ... come to discover them directly.